HOTELO, Lyon, Francja : Rezerwuj teraz! 25 people is taking into concideration that they will be 2 per double beds. 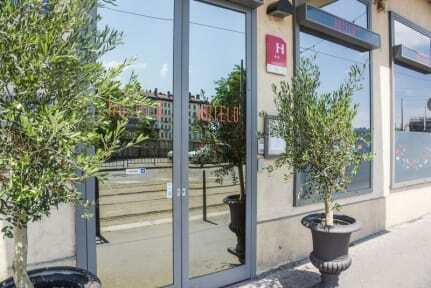 Located in the heart of the historical centre of Lyon, referenced at the UNESCO classification, the HOTELO hotel offer you 17 rooms for one to four person. The hotel has been totally refurbished and offer a smart decoration, a modern equipment and a personal service. 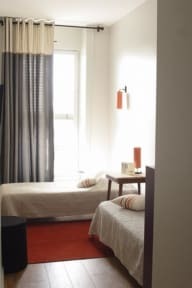 All rooms are with air conditioning, equipped with flat screen TV and an access to canal+ and all the TNT channels. For your business trip you’ll be able to work on the working desk in the room and the free Wifi access will give you the opportunity to have a working and pleasant stay, at the same time. The central location of the property give you an easy access to all area of Lyon. Access to the subway, buses, tramway and train in less than 5 minutes will make that you’ll never be far from your meeting point and all the point of interest of Lyon. On the evening you’ll have the opportunity to discover the famous « Bouchon Lyonnais, that are less than 10 minutes walking distance from the Hotelo. Please Note; Standard 3 Bed Private Family room has 1 Double Bed & 1 single bed.